Click here to find EGR valves for your vehicle. In simple terms, an EGR valve (Exhaust Gas Recirculation valve) allows small, but metered quantities of exhaust gas to be recirculated into the engine’s combustion chambers in order to limit the formation of harmful combustion products, the most notable of which is NOx, the principal component of urban smog. As such, EGR valves are critical emission control components on many vehicles, especially older vehicles that were built prior to the advent of variable valve timing. As a practical matter, most EGR valves are located on the intake manifold, and are connected to the exhaust system via a steel tube. In terms of construction, most EGR valves consist of a steel or aluminum body that encloses either a flexible diaphragm or a solenoid (depending on the design) that acts on a pintle that forms as a seal between the intake and exhaust systems. In practice, the EGR valve will always be in the closed position, and will only be opened by the engine management system when various sensors indicate that the current operating parameters such as engine speed and load are such that the combustion process is likely to produce high amounts of NOx. Nonetheless, when the engine management system deems the operating conditions suitable for the introduction of exhaust gas into the intake system, it will open the EGR valve by an amount that is calculated to introduce just enough exhaust gas to reduce the combustion temperature to below the point at which NOx forms. The engine management system typically does not open the EGR when the engine is idling because introducing exhaust gas into the intake under these circumstances would produce unstable, rough, or erratic idling. Similarly, exhaust gas is not typically introduced into the engine when running at low engine speeds in order to maintain stable combustion to avoid loss of power, and in some cases, the excessive emission of other harmful substances such as unburned hydrocarbons. However, given the harsh conditions that EGR valves have to endure for long periods, EGR valves are typically fitted with dedicated sensors that relay the status of the valve to the engine management system. In practice, these sensors monitor the position of the EGR valve pintle relative to a known closed position; the engine management system uses this information to both monitor the overall performance of the EGR valve, and to calculate the volume of exhaust gas that is flowing through the valve at any given moment. For some applications, the information supplied by the EGR valve is compared against input data from other sensors, such as oxygen sensors, dedicated NOx sensors in the exhaust system, exhaust gas temperature sensors, and others. Based on this complete set of information from a variety of engine sensors, the engine management system will further adapt or modulate the opening of the EGR valve to maintain optimum engine performance. Since EGR valves are critical emissions related components, any failure, defect, malfunction, or issue in the valve itself (or its electronics) will trigger one or more fault codes that will in turn illuminate the check engine light. This is a common problem, and occurs when the EGR is not closing off completely, thus allowing exhaust gas to enter the intake tract during idling. Note that in severe cases, such as when the EGR valve is stuck fully open, the engine may not idle at all or the engine may stall at low engine speeds. It should be noted that other components can also be responsible for rough idle, such as the idle control valve. Since the presence of exhaust gas directly affects the efficiency of the combustion process, the continuous introduction of exhaust gas, such as when the EGR valve is stuck even partially open, will affect combustion throughout the engine’s operating range. Therefore, larger throttle openings are required to counteract the effect of the exhaust gas being introduced into the intake, which uses more fuel without adding any power. This particular symptom is often accompanied by some degree of power loss. Since the presence of exhaust gas affects the efficiency of the combustion process, the combustion process maybe affected to the point where fuel does not combust fully (especially in the case of diesel motors), which usually results in thick clouds of black or gray smoke being emitted. This symptom may be accompanied by power loss. Most EGR valves are very easy to access, which makes replacing the average EGR valve an easy task that should be well within the capabilities of even novice DIY mechanics. It is important to note at this point that EGR valves are vehicle-specific, and even though two EGR valves may appear to be identical in all respects, EGR valves designed for different applications are calibrated differently, and are therefore NOT interchangeable with valves designed for other applications. Step 1 – Make sure the engine is cold to prevent scalds and burns. Remove all engine covers and/or shields, and locate the EGR valve on the intake manifold. Step 2 – If the valve is vacuum operated, locate and disconnect all vacuum hoses from the unit. Often times vacuum hoses are just pressed onto their connectors. If there are hose clamps, you may need a set of screw drivers to loosen the clamps. If the valve is electronically operated, disconnect the electrical connector. Use appropriate tools, such as a set of open wrenches, to disconnect the exhaust feed tube from the valve. Step 3 – Remove the bolts holding the valve down on the intake manifold. This can usually be accomplished using a socket set. In most cases, there are only a couple retaining bolts. Remove the old EGR valve from the engine, and make sure all old gasketing or sealing material is removed from the mating surface to exhaust prevent leaks. You can carefully use a gasket scraper to remove any gasket remnants. Step 4 – Using the new gasket or seal that came with the replacement valve, install the new valve, insert the fasteners, and torque them down to their recommended torque settings using a torque wrench. Note that it is important not to use any sort of gasket sealer when fitting the new EGR valve (unless the factory service manual calls for it, which would be rare), and especially not silicone-based sealers, since these materials could affect the operation of oxygen sensors as well as others. Step 5 – Reconnect the exhaust feed tube and all vacuum lines or electrical connectors, making sure that all connections are tight and properly engaged. Replace all engine covers and shields. Step 6 – If an OBD code reader is available, clear all fault codes and test-drive the vehicle to verify the repair. Note that in most cases, fault codes will be cleared automatically after a few drive cycles have been completed without an EGR related fault present. EGR valves made by Standard Motor Products are designed to be direct fit replacements for OEM equipment in terms of fit, form, and function, which ensures that SMP parts meet, or often exceed the performance specifications of OEM EGR valves. SMP typically uses only stainless steel for internal components to reduce corrosion of valve pintles and seats, thus ensuring correct and accurate metering of exhaust gas flow rates through the valve. Note though that although SMP markets their products under various brand names (including Standard, BWD, TechSmart, Intermotor, Hayden, ACI, and Four Seasons) , products sold under these brands conform to SMP’s strict engineering and quality control standards. Click here to find a Standard Motor Products EGR valve for your vehicle. Designed specifically for use on Ford applications, Motorcraft EGR valves are designed and engineered to Ford quality and performance standards. Note that Motorcraft EGR valves are also compatible with Lincoln and Mercury applications, provided that the correct EGR valve is chosen for the vehicle in qwuestion. Overall, Motorcraft designs high quality EGR valves and we are confident that they will serve you well if you drive a Ford vehicle. Click here to find a Motorcraft EGR valve for your vehicle. Dorman engineered and manufactured EGR valves are intended to be direct fit replacements for OEM equipment, and as such, all Dorman products are usually shipped with the required gaskets and/or seals to ensure trouble-free installation. Moreover, Dorman products are also tested on actual vehicles under real world driving conditions, which ensures that a Dorman replacement EGR valve will provide the same reliable performance and durability as an OEM unit. Overall, Dorman makes a great EGR valve and we don’t hesitate to recommend them for your next EGR replacement project. 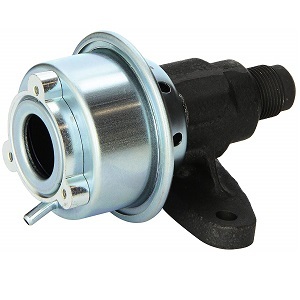 Click here to find a Dorman EGR valve for your vehicle.